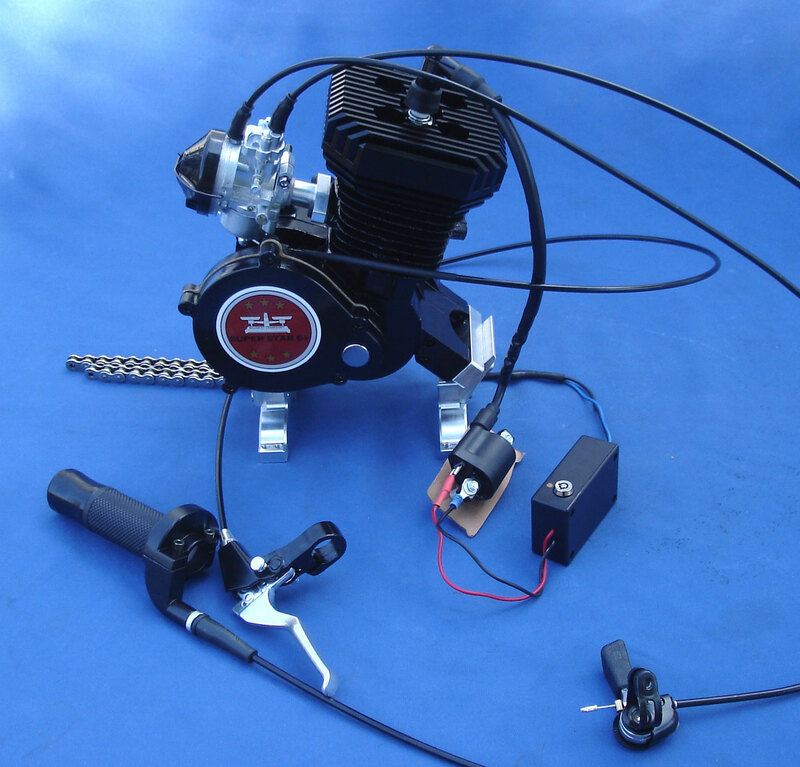 One of the more DIFFICULT Chinese 2 stroke motor INSTALLATIONS - MADE EASY! 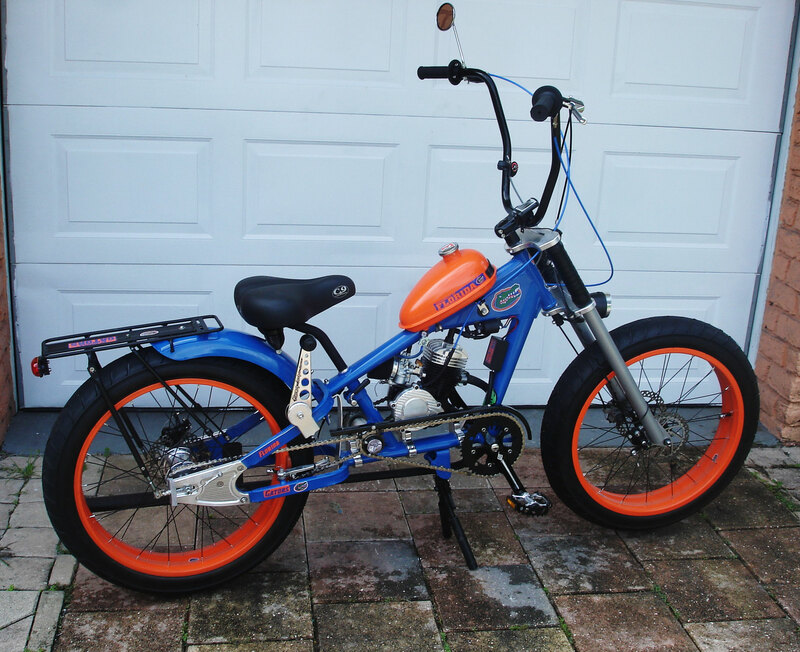 The OCC style Schwinn Stingray is IMPOSSIBLE to Motorize without the right Equipment. 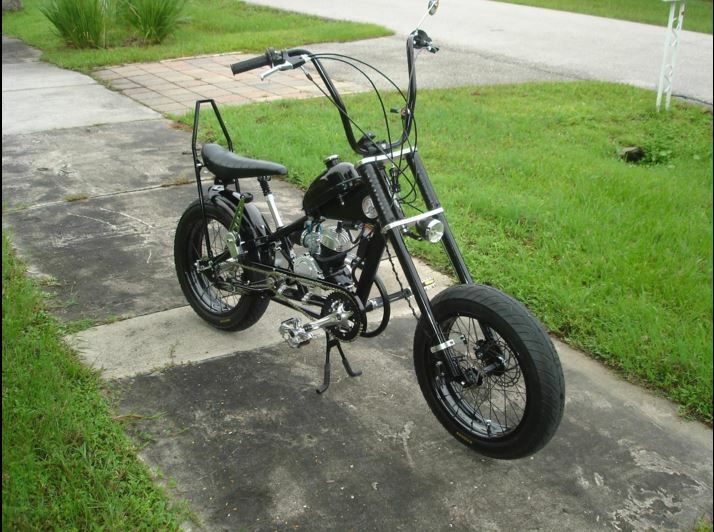 My Equipment list(s) below = reflects 10 years of building and selling almost exclusively Motorizing kits for this style of bike. All equipment is tried and true which = equals a happy customer everytime! Better yet! 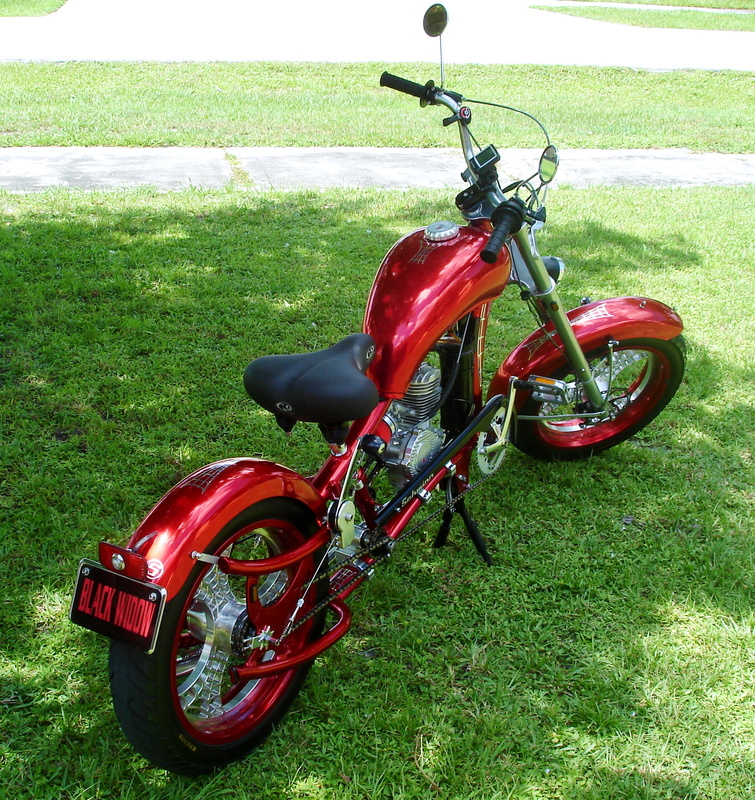 ~ all "kits" are pre-fit at my shop - prior to shipping - to assure EZ INSTALLATION on your end! 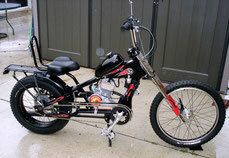 OUR KITS are TRULY THE BEST = PERFORMING, highest QUALITY PedalChopper "KIT" AVAILABLE! 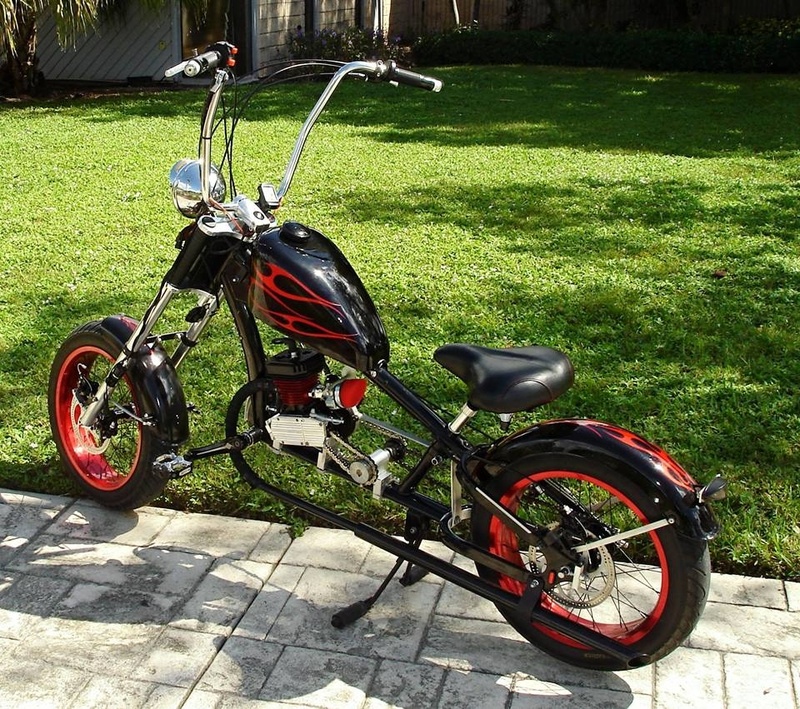 TRANSFORM ANY - OCC style Schwinn Stingray Chopper Bicycle into a Motorized PedalChopper! Our D.I.Y. "KITS" provide everything you need to accomplish the transformation! The BIKE itself is NOT INCLUDED in this KIT. 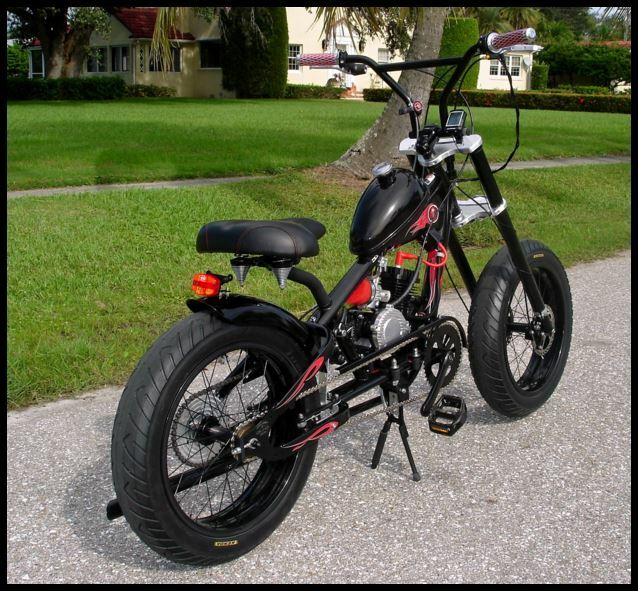 If YOU have the Bike => WE have everything else you will need! Review this entire page from TOP to BOTTOM to check out available options above and beyond our Premium Kit. [has ES = Electric Start option using a drill]. * UPGRADED - 40mm WIDE MOUTH Aluminum BILLET Intake Manifold. 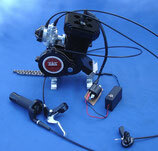 Carburator is pre-jetted & adjusted, Throttle cable trimmed to proper length for your bike. * CARBURATOR is INSTALLED ONTO MANIFOLD. * UPGRADED [STEEL] Throttle HOUSING w/ grips and separate “toggle” kill switch. * XL Drag Pipe - PIPE ships separately. perfect chain alignment and chain tension. 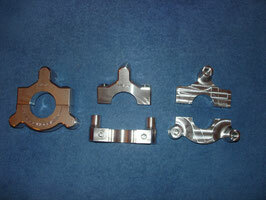 * Rear Axle - Chain Tensioners "Tweekers". * NOW! SUPER STRONG MAGNET for MAGNETO. Clamps onto hub and 3 fingers stick thru spokes for attaching rear drive gear. Best mounting option - keeps chain concentric and aligned! 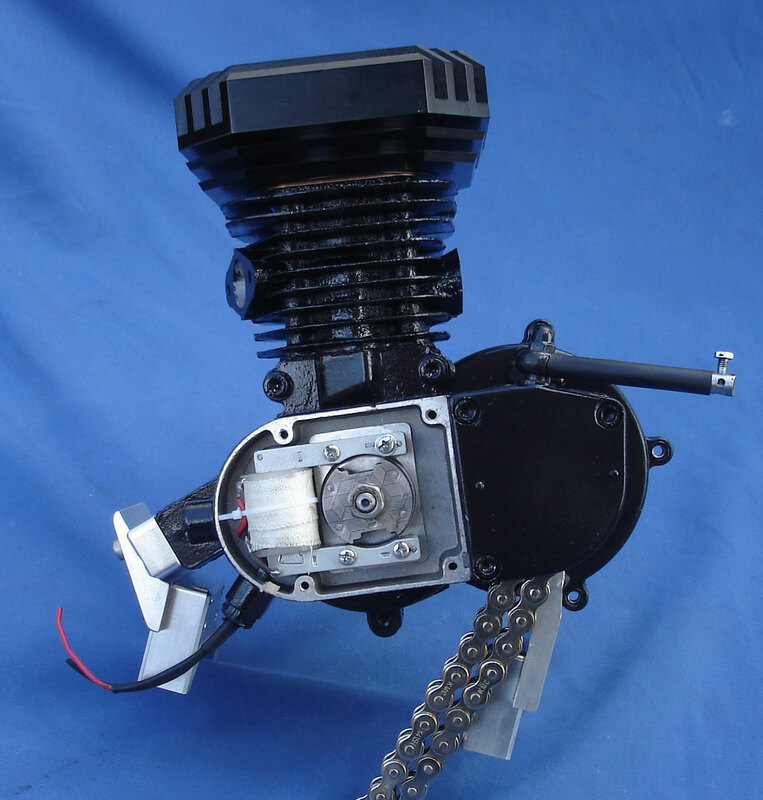 * INDUSTRIES BEST GRUBEE GT5A-ES, 66 / 80cc Motor [has ES = Electric Start option using a drill]. * LARGE 3 LITRE Fuel tank UPGRADE - now included with KIT. Fuel Line, Brass Petcock & Tank Mounting hardware. 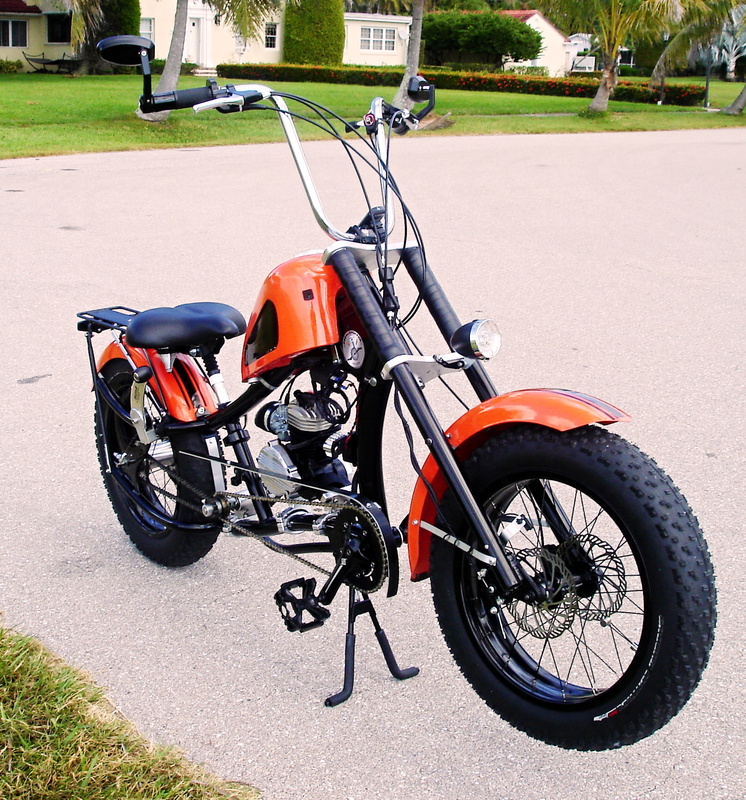 * Matching - 2 INTO 1 - RIGHT SIDE Brake Lever [connect 2 brakes to 1 lever] & LEFT SIDE Clutch Lever. 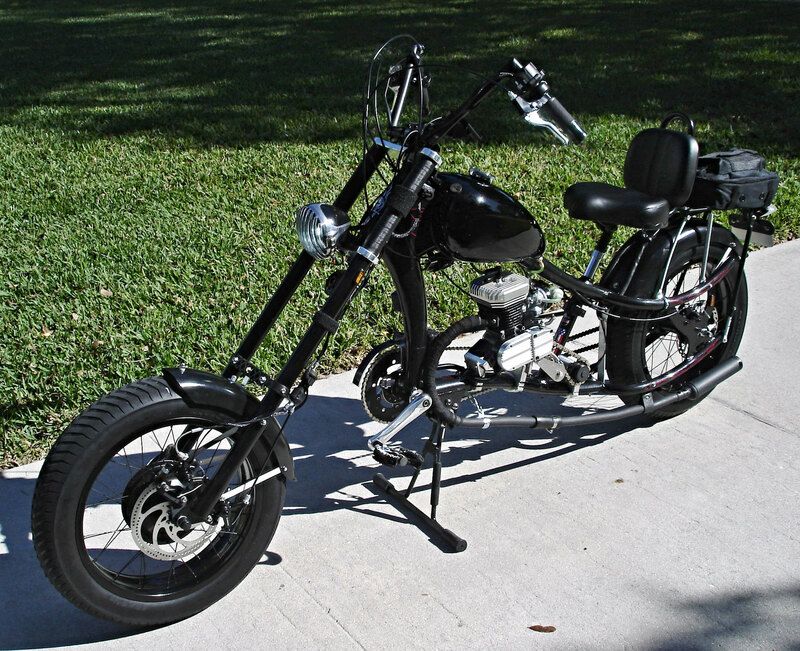 NOTE: BILLET ENGINE COVERS AVAILABLE BUT NOT INCLUDED. Most paint schemes included in price. SMOOTH! and... FAST! 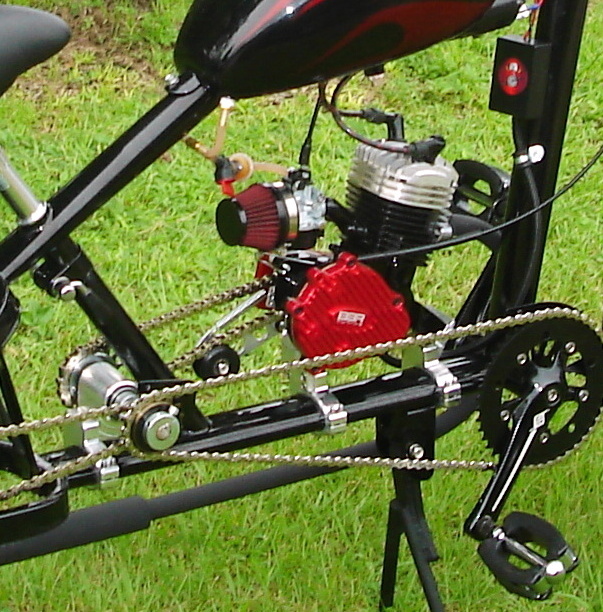 SUPER STAR 6+ with Balanced Racing Crank Shaft! 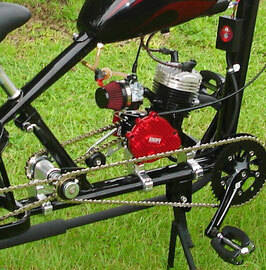 * INDUSTRIES BEST GRUBEE GT5A, 66 / 80cc Motor. THIS IS A BRAND NEW OFFERING - SO BETTER PHOTO FORTHCOMING. 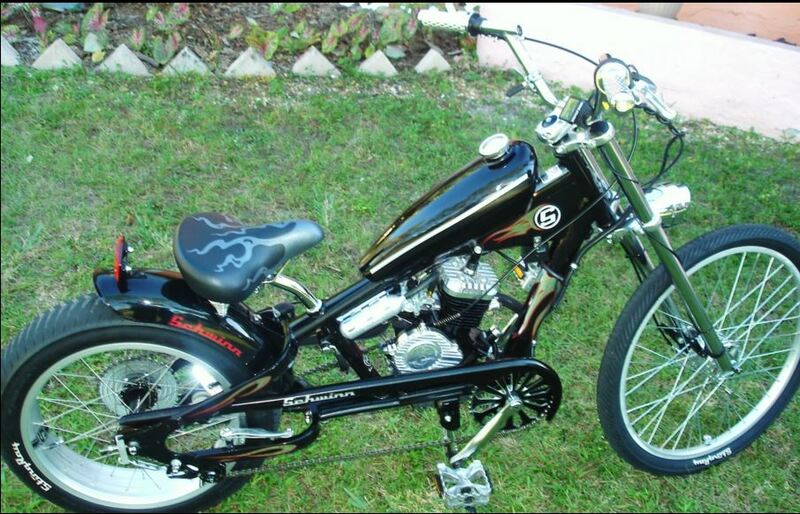 FEATURING "V-TWIN FIRE" IGNITION / BALANCED RACING CRANK / PORT MATCHED, PORTED & POLISHED CYLINDER.. ...QUESTIONS OR FOR QUOTE CONTACT ME IN FORM BELOW.